At nearly two metres, or six feet, across, Salisbury Cathedral from the Meadows was designed to be noticed. It belongs in the category of paintings that have come to be known as Constable’s ‘six-footers’, a highly varied group of thirteen paintings produced between 1819 and the end of his life, each measuring around six feet wide by four high.6 In accordance with his wider oeuvre, the majority subject of these large pictures is Constable’s native Suffolk, epitomised by The Hay Wain. This was the landscape of his ‘careless boyhood’ which, he said, had ‘made [him] a painter’.7 Viewed this way, Salisbury Cathedral from the Meadows, along with Tate’s other six-foot canvases – such as The Opening of Waterloo Bridge (‘Whitehall Stairs, June 18th, 1817’) 1832 (Tate T04904), Chain Pier, Brighton 1827 (Tate N05957) and Sketch for ‘Hadleigh Castle’ c.1828–9 (Tate N04810) – emerge as geographically disparate and peripheral six-foot subjects, a status confirmed by the popular perception of the artist as being rooted in ‘Constable Country’. Born into a prosperous family in the village of East Bergholt, Suffolk, Constable’s early display of aptitude and passion for painting led to his being freed of the obligation to enter his father’s business of grain milling and goods shipping on the River Stour, although his experience of this work gave him the intimate knowledge of the local landscape that fuelled his lifelong compulsion to depict it. In 1799, at the age of twenty-three, he moved to London and began training at the Royal Academy of Art. He developed his principles as a landscape painter based on his exposure to the work of Richard Wilson and Thomas Gainsborough, eighteenth-century pioneers of the genre in Britain, and the seventeenth-century French painter Claude, as well as through the mentorship he received from the tastemaker, collector and amateur artist Sir George Beaumont and the contemporary landscape painter Joseph Farington, who was heavily involved in the running of the Academy. Constable’s first accepted submission to the annual Royal Academy exhibition was a Suffolk landscape, The Edge of a Wood 1802 (Art Gallery of Ontario, Toronto), but much to the artist’s frustration, it was portraiture and not landscape that provided his consistent income well into the 1820s. Constable’s dissatisfaction with his public reputation is well documented in the large corpus of his surviving correspondence, through which his career appears as a long and persistent struggle to prove his worth as a landscape painter, be that to the Bicknell family, who thought him an unworthy match for their daughter Maria (the pair married in St Martin’s in the Fields, London, on 2 October 1816), to the public, to the critics or to the Academicians, in whose hands his professional recognition rested. No doubt it was Constable’s repeatedly frustrated attempts to gain election to the Academy and his desire to solicit attention from the critics that spurred him to enlarge his canvases to the six-foot scale. Not only would this format amplify his presence in the dense hang of the Academy’s annual exhibitions but it also drew a link between the aspiring Constable and his role models Gainsborough, Wilson and Farington, who had set a prestigious precedent for exhibiting large landscapes. Constable had experimented with a larger canvas size (a ‘half-length’ at 127 x 102 mm) in bids for recognition in 1813 and 1817, but it was not until his debut six-foot canvas, a summer scene of working life on the River Stour named The White Horse 1819 (fig.4), that critics engaged more seriously with his work. When in 1820 Constable was elected an Associate of the Royal Academy, the first step to becoming a full member, it must have seemed like this upscaling to a six-foot canvas had worked. It became his favoured format for the expression of his most ambitious compositions, the paintings he sought to be defined by. So enthused had be become by the larger canvas that in 1821 he wrote: ‘I do not consider myself at work unless I am before a six-foot canvas’.8 Constable had augmented his preparatory process for The White Horse by making a six-foot sketch in which the composition, light effects and colouring were tested at full-scale, an interim stage which then became an integral part of the process by which subsequent six-footers were made.9 The production of sketches on such a large format was a novel step but it was also an expensive one: two large canvases meant risking double the outlay on time and materials for the potential sale of only one (for Constable never sold his sketches, and does not appear to have used the reverse of any of the six-foot sketches). Complaining that ‘painting these large pictures have [sic] much impoverished me’, Constable appealed to his friend John Fisher for ‘a loan of £20 or £30’ in 1822.10 In various ways discussed below, this friendship would become an important factor in the production of Salisbury Cathedral from the Meadows. Salisbury Cathedral from the Meadows was the third and last of the finished, exhibited oil paintings that arose from this material. The first, Salisbury: Morning 1812 (untraced), was undoubtedly on a smaller scale and was possibly the picture that Fisher had come to own and appraise in his letter. Although not singled out for specific attention, this and his other 1812 Royal Academy exhibits earned Constable a place in critics’ roll calls of notable contributors in the field of landscape.14 His next Salisbury painting, also smaller at 876 x 1118 mm (2.9 x 3.6 ft), came eleven years later in the form of Salisbury Cathedral from the Bishop’s Grounds 1823 (fig.5). The existence of three versions of this latter offering, discussed below, attests to the void that had begun to open up between Constable’s personal vision for an expressive, animated landscape, and the picturesque expectations of his patron, which reflected those of the wider public at that time. Constable’s patron for Salisbury Cathedral from the Bishop’s Grounds was the Bishop, who had encouraged the artist to develop it from a sketch.15 Despite having been ‘dreading’ work on this, which he referred to with typical hyperbole as ‘the most difficult subject in landscape I ever had upon my easil [sic]’, Constable was pleased enough to submit it to the Academy’s annual exhibition, although he was anxious that this would be the first year since 1819 that he would not be represented by a six-foot canvas.16 The artist reported his difficulty with this smaller Salisbury canvas to be the depiction of the cathedral’s celebrated Gothic architectural detail, its ‘windows, buttresses, &c, &c,’.17 The ultimate difficulty and cause for reworking the painting was the Bishop’s unease at the dark clouds with which Constable had animated the sky. A new, sunnier version was thereby produced (Salisbury Cathedral from the Bishop’s Grounds 1823, Huntington Collection, San Marino), which the Bishop gave to his daughter as a wedding present, but Constable had not yet finished a third version for the Bishop before the latter’s death in May 1825. This third one – Salisbury Cathedral from the Bishop’s Garden (Frick Collection, New York) – was finished a year later, in 1826, and given to the Bishop’s widow. Fisher, meanwhile, purchased the original (fig.5) with its ‘dark cloud’ but was forced to sell it back to the artist in December 1829, having fallen on hard times. This ‘dark cloud’ painting of Salisbury, replete with unfortunate provenance, was thus back in Constable’s studio at the very moment he began working on his third and final painting of that same landscape, Salisbury Cathedral from the Meadows. Constable spent a total nearing five weeks in Salisbury in 1829: three weeks in July and a further two in November on a visit which would be his last. 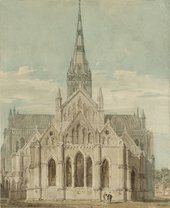 These visits gave rise to around thirty-eight studies in pencil, watercolours and oils in which the Salisbury landscape can be identified.22 Four drawings in pencil and three oil sketches directly relate to the composition of Salisbury Cathedral from the Meadows and show the artist working through ideas for colour schemes, atmosphere and figures. Two pencil sketches are thought to have been made in July, judging by the full foliage on the trees,23 while another (fig.6), as Wilcox has suggested, can be confidently assigned to November from its inscription of ‘11.1829’, a presumable indication of the month it was made.24 Evidently satisfied that this composition represented the best combination of ideas first expressed in the two July drawings, this design was squared up so that it could be transferred and developed on a larger scale in the oil sketch Salisbury Cathedral from the Meadows ?1829 (Tate N01814), which was then itself squared up using threads – indicated by regularly spaced holes at the canvas edges – for transfer of the design to the six-foot sketch (fig.7).25 From the making of the pencil sketch it would be another twelve months until the artist turned his full attention to production of a six-foot version of the composition, despite encouragement from Fisher, who had hoped to see the finished canvas exhibited in 1830. It must be said, however, that by comparison with other large-scale paintings, particularly the fourteen-year incubation of The Opening of Waterloo Bridge (‘Whitehall Stairs, June 18th, 1817’), Constable’s Salisbury Cathedral was conceived, developed and exhibited within a relatively short space of time. Like most of the other six-footers, Salisbury Cathedral and its full-scale sketch are painted on plain weave linen canvas.26 The size and shape of each canvas in the series varies in accordance with Constable’s original intentions, changes he made, or subsequent alterations to the canvases in the years since his death. The Lock 1824 (private collection) is uniquely portrait in orientation, while Chain Pier, Brighton started out larger but was cut down by Constable to the size of a regular six-footer after its exhibition in 1827; Salisbury Cathedral from the Meadows is the most square of the group.27 Comparison of Salisbury Cathedral with the more rectangular full-scale sketch held at the Guildhall (fig.7) shows how this additional six inches (or 15 centimetres) of height aids the centripetal composition of the finished painting, in which the cathedral’s central force is emphasised by the circular path effected by the rainbow, the tree and the River Nadder, with its wading horses and cart. The eye is encouraged to follow the river – an undulating ‘line of beauty’ of the kind that artist William Hogarth (1697–1764) identified in ‘winding walks, and serpentine rivers’28 – into the heart of the composition, through the glistening thicket, up the tree trunk and back down along the arc of the rainbow. This additional height also allows for a lengthened foreground path and a greater sense of depth, although the painting retains some of the lateral thrust of the wider-angled sketch. This strong horizontal emphasis encourages us to take in the composition’s peripheral features. By comparison to the thick layers of impasto in the centre of the canvas, the far right portion of the painting is given a distinct serenity by its unity of light tones and textural homogeneity – Constable has used predominantly horizontal brushstrokes to describe the Harnham Water Meadows and the streaked, glassy surface of the river. In the right-hand foreground is the Nadder, which flows into the Avon as it reaches the bounds of the Cathedral Close; on the left is the smaller overflow stream of the ‘back’ Avon, now no longer there.29 Given that all of his six-foot paintings feature water, Constable clearly felt a compulsion towards it (perhaps owing to its presence in his upbringing on the banks of the Stour) but in Salisbury this was particularly apposite. Lack of water had motivated the twelfth-century clergy to remove the cathedral from Old Sarum to its present site, while an 1830 account of the city by an associate of Constable’s, the antiquarian writer John Britton, described the rivulets running through Salisbury’s streets as a ‘singularity’. Furthermore, as landscape historian Charles Watkins describes in this In Focus, the carefully managed water meadows in the immediate vicinity of the cathedral (the Harnham Meadows) were a particular source of regional pride and prosperity.30 It is thus appropriate for the cathedral to be presented as a hulk of stone in a watery landscape, its spire piercing the cloud-filled sky. In the late 1820s Constable became more interested in antiquarian culture. He would have known of the controversy surrounding Salisbury Cathedral’s appearance, for the debate simmered on in publications like guidebooks, which heaped either praise or scorn upon Wyatt’s intervention. By evading close-up representation of the cathedral in his six-foot painting, Constable perhaps hoped to appeal to all parties with an antiquarian interest in the building, whatever their stance. It also served to mitigate against the need to finely render the cathedral’s architectural detail, a task which had contributed to his difficulty in painting Salisbury Cathedral from the Bishop’s Grounds (fig.5) and caused one critic, writing in the Morning Chronicle, to respond that ‘less attention to detail would have been better’.34 The breadth of touch with which Constable described the cathedral in Salisbury Cathedral from the Meadows was perhaps also conditioned by the practicalities of his preference at this stage for thicker layers of paint, as well as expectations of oil paintings in general. Academically, this was a lowly topographical subject more commonly represented in watercolour and print than in oil, as can be seen in George Fennel Robson’s engraving South-West View of the City of Salisbury 1827 (fig.8) and Turner’s graphite and watercolour work Salisbury Cathedral from the East c.1798 (Tate D00668; fig.9). To paint it in oil on such a scale as the six-foot canvas was therefore to forge new ground. Compositionally, too, Salisbury Cathedral sits apart from the majority of views of Salisbury produced up to that point. It was common for the cathedral to take precedence, either through the drama of its silhouette, piercing the sky and denoting the city’s location like a pin on a map, or else by filling the picture plane in images that allowed the intricacies of its architecture to be appreciated (see Turner’s Salisbury Cathedral from the East, fig.9). The city was largely concealed from view, or else distanced and miniscule by comparison to the majestic stature of the cathedral. Constable, however, firmly roots the sacred building into the landscape around it. His cathedral nestles among and connects the urban and the rural, becoming a conduit between city and meadow – man and nature – in what perhaps amounts to a manifestation of the artist’s faith in the Church as an agent of a harmonious, prosperous and virtuous society. In the painting, the buildings in the cathedral’s immediate surroundings are those of the Cathedral Close, which covered an area so large as to be described by writer Daniel Defoe in 1792 as ‘like another city’.35 Past tension between cathedral and city is indicated by the red-brick wall, built in 1327 to protect the clergy, bounding the Close at the edge of the meadow on the right-hand side. The house immediately to the left of the wall has been identified as Leadenhall (sometimes spelled ‘Leydenhall’), the house in which Constable’s friend Fisher lived and in which the artist had stayed when the idea for Salisbury Cathedral was hatched; it was demolished in 1917.36 The treatment of other buildings, however, for example the terracotta-roofed structures just left of the centre, exhibit Constable’s disregard for topographical veracity, a frequent trait of his work by the late 1820s.37 Assuming Constable’s viewpoint to be a position on the bank of a bend in the River Nadder just by Fisherton Mill, a near-contemporary map (fig.10) offers no sign of any building upon this river island, nor do these structures appear in the pencil sketch closest to the painting in composition that is thought to have been made on his July visit (Fitzwilliam Museum, Cambridge; fig.11).38 The building in this position in the Guildhall’s six-foot oil sketch is larger and more plausible as an outbuilding or, to a lesser degree, a building in the north-west corner of the Cathedral Close. In the final painting, however, a confused sense of perspective arises from the disparity of scale between the red-roofed buildings and the figure on the cart. Constable also appears to flout topography and perspective in his depiction of the second most recognisable building in the painting after the cathedral, the church of St Thomas at the far left. Sitting outside the bounds of the Cathedral Close, this was one of the original sites of worship in Salisbury, or New Sarum as it was then called, founded in 1240 as a chapel-of-ease to the cathedral, which was then just over half way through its construction.39 Barely detectable in the Fitzwilliam Museum pencil drawing (fig.11), St Thomas’s became gradually more prominent as Constable worked his composition up in tandem with increases in the size of his support – in Salisbury Cathedral it is given identifiable detail and defined sufficiently enough to attract the eye, with help from the bright red garb of the figure in the foreground and the obsolete, slanting gatepost, most likely a remnant of the apparatus surrounding the defunct Fisherton Mill. We are clearly meant to notice the church and yet by consultation of the map, it would seemingly not be visible from Constable’s vantage point. Compositionally, however, it provides a focal point for the avenue recess in foliage on the left, a device to pull the eye to the deepest realm of pictorial space. 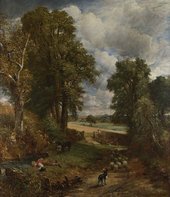 Such a device was frequently seen in paintings by Claude (such as his Landscape with Jacob, Laban and his Daughters 1654, Petworth House, West Sussex), whose work continued to provide inspiration to Constable in his late years. St Thomas’s, by its proximity, serves to emphasise the physical and spiritual relationship between cathedral and city. This passage came from ‘Summer’ in the 1730 poem The Seasons by James Thompson, which was a popular literary source for painters wishing to aggrandise their landscapes with added emotive charge. With its overarching theme of man’s fate being in the hands of Godly magnitude and the forces of nature, ‘Summer’ was particularly popular with artists such as Turner. The reference in Thompson’s ‘Summer’ to the story of the mythical lovers Celadon and Amelia, the latter of whom, after being struck by lightning, dies in her lover’s arms, may have resonated particularly with Constable after the death of his wife in 1828. The following year he appended a quotation from the same poem to Hadleigh Castle, The Mouth of the Thames – Morning after a Stormy Night 1829 (Yale Center for British Art, New Haven), a melancholy landscape that is more overt in its potential to be interpreted as an expression of grief, with its motif of a ruined tower and a lone shepherd in a bleak, blustery landscape. It was likely not only grief that steered Constable towards the grander themes, heightened drama and bravura handling of paintings like Hadleigh Castle, Salisbury Cathedral from the Meadows and The Opening of Waterloo Bridge. In February 1829 Constable’s ten years as an associate of the Academy were over and his professional ambition was fulfilled by his election – won by a single vote – to full membership of the Royal Academy. Constable’s approach to his work played into the critics’ hands. Plagued by self-imposed pressure and fear of failure, he would procrastinate, run out of time, and be forced to submit paintings for exhibition that were not yet finished. This, plus sensitivity to criticism, the inability to be satisfied with his work and complications arising from his hasty technique compelled Constable to rework paintings post-exhibition. Although its return to the easel makes it impossible to know exactly how Salisbury Cathedral first appeared in 1831, research by conservator Sarah Cove has pinpointed features of his reworking as well as chemical changes that create obstacles in our reading that parallel those faced by its first public. Constable’s treatment of the houses at the far left, for example, whereby thick, globular paint was applied over layers that were almost dry, has caused cracks to form that dissolve the definition of form and tragically reduce the efficacy of Constable’s reworking (fig.13). The thicket of foliage below the cathedral has suffered from the discolouration over time and with exposure to impure air of its patent yellow, originally bright and citrus in tone and now a dull ochre; Constable’s lead white, on the other hand, has not altered, and thus sits in stark contrast to the dulled yellow such that each branch, twig and leaf is brilliantly highlighted and thrown into jarring relief against darker paint below.74 Constable spoke of the ‘mellowing hand of time’, implying an understanding of the changes that would occur in the material make-up and outward appearance of his paintings, however this muting of colour has collapsed both the contrast between shade and darkness, and between mid- and foreground, compounding the overall disjointedness of the composition and its unsettling appearance.75 Yet this effect – the extent of which is unintentional – lends drama and force to the painting that, combined with his radical laying of thick, impastoed paint, and his use of the pallet knife and a complex composition, demands more from the viewer than perhaps his contemporaries were prepared to give. Constable, like many other London-based artists, took advantage of the burgeoning fine arts scenes in regional cities.79 He had exhibited work in Birmingham on three previous occasions and although it is possible that Salisbury Cathedral may have been a loan solicited by the increasingly ambitious Society of Artists to lend their show metropolitan pizzazz and prestige, the 1834 catalogue tells us the work was placed in the rather modest surroundings of the ‘Front Room, West’, rather than in the Great Room.80 At number 317, this was the furthest into their exhibition list that he had thus far been placed – perhaps his last-minute reworking of Salisbury Cathedral had, again, compromised its appeal. Like the rainbow, which builds on the sunnier patch of sky to the right of the painting, this succinct excerpt more efficiently and emphatically iterates the theme of hope than the longer passage from Thompson, whether or not this change of reference arose from restrictions on space per exhibit in Birmingham’s exhibition catalogue. For its Worcester showing in 1836, the painting’s subtitle was changed slightly again to Summer Afternoon – A Retiring Tempest. These new subtitles give weather an equal footing with location in the picture’s title, bringing Salisbury Cathedral in line with the atmospheric emphasis of titles in Constable’s print portfolio, English Landscape Scenery (published in 1831). Here compositions depicting recognisable ‘Constable Country’ topographies such as Dedham Vale (for example Dedham from Langham ?1813, Tate N02654) were given generic titles in print, like Summer Morning. The Rainbow, the title for the print of Salisbury Cathedral from the Meadows on which Constable was still working in the days before his death on 31 March 1837 (fig.12), brings, by association, a sense of calm to a painting that constituted a battleground of meanings and which originated at a time of great turbulence, both private and public. These changes set in motion the process by which the painting’s layers of meaning, like the paint on its surface, are continually applied and evolving. 1. The committee included poet William Wordsworth, scientist Michael Faraday and portraitist Sir William Beechey. 2. C.R. Leslie, Memoirs of the Life of John Constable , ed. by Jonathan Mayne, London 1951, pp.267–8. 3. Athenaeum, 7 May 1831, p.300. 4. In 2014 members of the Society for All Artists voted The Hay Wain their second favourite painting behind Monet’s Water Lilies series (1897–1926). The Hay Wain had come second in 2005, too, when listeners to BBC Radio 4’s Today programme were asked to name their favourite painting; in this instance, Turner’s The Fighting Temeraire 1839 (National Gallery, London) came out on top. See Hannah Furness, ‘The Nation’s Favourite Paintings Revealed’, Telegraph, 22 February 2015, http://www.telegraph.co.uk/news/newstopics/howaboutthat/11427972/The-nations-favourite-paintings-revealed.html, accessed 10 October 2016; and Charlotte Higgins, ‘A Home-Grown Victory as Turner Tops Poll for Best Painting’, Guardian, 6 September 2005, http://www.theguardian.com/uk/2005/sep/06/media.bbc, accessed November 2015. 6. There are twelve pairs of full-scale sketches and exhibited works. Only one version exists of the thirteenth composition, Stoke-by-Nayland 1835–7 (Art Institute of Chicago, Chicago), which was never exhibited. 7. R.B. Beckett (ed. ), John Constable’s Correspondence, 6 vols., Ipswich 1962–8, vol.6, 1968, p.78. 8. R.B. Beckett (ed. ), John Constable’s Correspondence, 6 vols., Ipswich 1962–8, vol.4, 1966, p.76. 9. He had hitherto pursued a rather conventional method of assimilating plein air oil sketches made on small portable boards into studio-based sketches in which the composition and light effects would be worked out on a scale smaller than the resultant finished work. 13. Timothy Wilcox, Constable and Salisbury: The Soul of Landscape, exhibition catalogue, Salisbury and South Wiltshire Museum, Salisbury 2011, p.13. 14. Judy Crosby Ivy, Constable and the Critics 1802–1837, Woodbridge 1991, pp.66–7. 15. The Bishop had admired a sketch of the view (Salisbury Cathedral from the Bishop’s Grounds 1820, National Gallery of Canada, Ottawa) and formalised his interest in a letter to Constable of 4 November 1822, expressing his hopes that a finished version would soon be ‘ready to grace my Drawing Room in London’. Beckett 1968, pp.101–2. 16. Letter from Constable to Fisher, 9 May 1823, in Beckett 1968, p.115. 19. Sarah Cove, ‘The Painting Techniques of Constable’s “Six-Footers”’, in Anne Lyles (ed. ), Constable: The Great Landscapes, exhibition catalogue, Tate Britain, London 2006, pp.54, 56. 20. Constable to C.R. Leslie, 21 January 1829, in R.B. Beckett (ed. ), John Constable’s Correspondence, 6 vols., Ipswich 1962–8, vol.3, 1965, p.18. 21. In a letter of 3 September 1829, Fisher remonstrated with Constable over his lack of progress in the autumn months, stating that this was repeatedly ‘the chief reason of the unfinished, abandoned state of your surface on the first of May’. Beckett 1968, p.252. 22. Graham Reynolds, The Later Paintings and Drawings of John Constable: Text, New Haven and London 1984, pp.199–232. 23. Held in the Fitzwilliam Museum, Cambridge (PD 899.17), and the Yale Center for British Art, New Haven (B2001.2.729); oil sketches deriving from these are reproduced in Reynolds 1984, pls.794, 795. 25. See ‘Tate Pre-Acquisition Conservation Report: T13896’, November 2012, Tate Conservation File; Lyles 2006, p.180; overpainting by a later hand, most marked in the transformation of the cathedral into a castle in an attempt to ‘finish’ the Guildhall sketch, was removed in 1951. See Charles Rhyne, ‘The Remarkable Story of the “Six-Foot Sketches”’, in Lyles 2006, p.44. 26. The exception is Sketch for ‘Hadleigh Castle’ c.1828–9 (Tate N04810), which is painted on medium-weight twill. See Cove 2006, p.54. 27. Ibid., p.56; the canvas of Salisbury Cathedral measures approximately 1518 x 1899 mm; the dimensions of the Guildhall’s sketch are 1358 x 1880 mm, a size which incorporates additions at left and right. See the appendix in Lyles 2006, p.210. 28. William Hogarth, The Analysis of Beauty , ed. by Ronald Paulson, New Haven and London 1997, pp.34, 51. 29. The ‘back’ Avon was filled in during the 1950s. I am very grateful to historian Tim Tatton-Brown for this information and his help in identifying the rivers. 30. John Britton, Picturesque Antiquities of the English Cities, London 1830, p.66; Charles Watkins, ‘Landscape Management’, in Amy Concannon (ed. ), In Focus: ‘Salisbury Cathedral from the Meadows’ exhibited 1831 by John Constable, February 2017. 31. William Beckford writing on 21 October 1817, in Boyd Alexander (ed. ), Life at Fonthill, 1807–22, London 1957, pp.228–9; John Britton, The History and Antiquities of the Cathedral Church of Salisbury; Illustrated with a Series of Engravings, Views, Elevations, Plans, and Details of that Edifice etc., London 1814, p.vi. 32. John Britton, The Beauties of Wiltshire, Displayed in Statistical, Historical, and Descriptive Sketches: Interspersed with Anecdotes of the Arts, vol.1, London 1801, pp.48–9. 33. Ian Warrell, Turner’s Wessex: Architecture and Ambition, exhibition catalogue, Salisbury Museum, Salisbury 2015, p.12. 34. Quoted in Wilcox 2011, p.107. 35. Daniel Defoe, A Tour Thro’ the Whole Island of Great Britain, Divided into Circuits or Journies, London 1724, p.29. 36. Royal Commission on the Historical Monuments of England, Salisbury: The Houses of the Close, London 1993, p.40. 37. See, for instance, Constable’s The Glebe Farm c.1830 (Tate T12293). 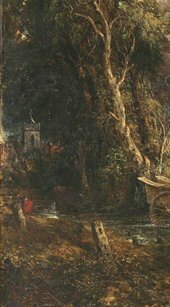 Tate’s display caption for this painting demonstrates the extent to which Constable experimented with and altered the architectural elements of such scenes: http://www.tate.org.uk/art/artworks/constable-the-glebe-farm-t12293, accessed 10 October 2016. 38. Reynolds 1984, p.209, R29.43. The work is identified here using Graham Reynolds’s numbering system. 39. J[ames] Easton, The Salisbury Guide, Giving an Account of the Antiquities of Old Sarum and the Ancient and Present State of New Sarum, or Salisbury, 25th edn, Salisbury 1810, p.32. The cathedral was constructed between 1220 and 1258. 40. For more on the livestock that grazed on the Salisbury meadows, see Watkins 2017. 41. Leslie Parris and Ian Fleming-Williams, Constable, exhibition catalogue, Tate Gallery, London 1991, p.364. 42. See Paul D. Schweizer, ‘John Constable, Rainbow Science, and English Color Theory’, Art Bulletin, vol.64, no.3, September 1982, pp.424–45, and John E. Thornes, John Constable’s Skies: A Fusion of Art and Science, Birmingham 1999, pp.82–3; discussion of the phenomenon was prompted by the painting’s acquisition by Tate and partners in May 2013. See, for example, Nick Stedman, ‘Over the Rainbow’, in ‘Letters to the Editor’, Times, 25 May 2013, http://www.thetimes.co.uk/tto/opinion/letters/article3774368.ece, accessed 10 October 2016. 43. See John E. Thornes, ‘A Reassessment of the Solar Geometry of Constable’s Salisbury Rainbow’, in Amy Concannon (ed. ), In Focus: ‘Salisbury Cathedral from the Meadows’ exhibited 1831 by John Constable, February 2017. 44. R.B. Beckett (ed. ), John Constable’s Discourses, Ipswich 1970, p.61. 45. Anne Gray and John Gage (eds. ), Constable: Impressions of Land, Sea and Sky, exhibition catalogue, National Gallery of Australia, Canberra 2006, p.354; Wilcox 2011, p.153. 46. Beckett 1966, pp.427, 433. 48. Paul D. Schweizer, ‘John Constable and the Rainbow’, PhD thesis, University of Delaware, Newark 1979, pp.58–90; Schweizer 1982, p.426. 51. See Brian Young, ‘Religion and Politics’, in Amy Concannon (ed. ), In Focus: ‘Salisbury Cathedral from the Meadows’ exhibited 1831 by John Constable, February 2017. 52. John Miller, Sermons Intended to Show a Sober Application of Scripture Principles to the Realities of Life, Oxford 1830, p.x. 53. Beckett 1968, p.159. It would appear that ‘The Church in Danger’ refers to ‘The Church is in Danger’, a common phrase in rhetoric supporting the Church. 54. Morning Post, 23 March 1832, p.1. Rose was MP for Christchurch in Dorset from 1818 to 1832. 56. For a more detailed discussion of Constable’s attitude to the Great Reform Act, see Young 2017. 57. James Thompson, ‘Summer’, in The Seasons, London 1744, lines 1223–31. 58. This anecdote comes from David Roberts and is related in George Walter Thornbury, The Life of J.M.W. Turner, R.A., London 1862, vol.2, p.56, and dated to 1831 by A.J. Finberg in The Life of J.M.W. Turner, R.A., Oxford 1961, p.327. 59. Literary Gazette, 14 May 1831, p.315. 60. The review was published in Library of the Fine Arts, 1 June 1831, p.421, cited in a letter from Constable to C.R. Leslie, 2 June 1831, in Beckett 1965, p.40. 61. Athenaeum, 14 May 1831, p.315, emphases in the original. 62. Morning Herald, 3 May 1831, p.5. 64. New Monthly Magazine, 1 July 1831, part 3, p.315; Englishman’s Magazine, 1 June 1831, p.323. 65. Robert Hunt observed a ‘crudeness of effect’ in Constable’s 1812 exhibits, writing in the Examiner, 7 June 1812, p.363. Robert was the brother of the Examiner’s editor, Leigh Hunt, and John Hunt, its publisher. 66. Metropolitan, vol.1, June 1831, p.70; Observer, 29 May 1831, unpaginated; for Constable’s reference to legal action see Beckett 1966, p.104. 67. The manuscript of this letter is contained within an extra-illustrated copy of Thornbury 1862, vol.7, f.70, British Library, London. 68. Charles M. Westmacott, A Descriptive and Critical Catalogue to the Exhibition of the Royal Academy, London 1823, p.13, cat. no.59. 69. Library of the Fine Arts, 1 June 1831, p.421. 70. Spectator, 21 May 1831, p.501. 71. Morning Post, 2 June 1831, unpaginated. 72. Constable to Fisher, 24 May 1830, in Beckett 1968, p.258. 73. Anthony Bailey, John Constable: A Kingdom of his Own, London 2007, p.224. 74. For further technical analysis of this and other Constable paintings, see Cove 2006, pp.52–67, and Cove in Parris and Fleming-Williams 1991, pp.493–529. 75. Alexander Brodie (ed. ), The Reminiscences of Solomon Hart R.A., London 1882, p.58. 76. Re-exhibition at the British Institution was not unusual. Morning Post, 4 February 1833, unpaginated. 77. R.B. Beckett (ed. ), John Constable’s Correspondence, 6 vols., Ipswich 1962–8, vol.5, 1967, p.42. 78. Birmingham Advertiser, 20 November 1834, p.4. I am grateful to John Thornes for drawing my attention to this review. 79. See Trevor Fawcett, The Rise of English Provincial Art: Artists, Patrons and Institutions outside London, 1800–1830, Manchester 1974. 80. Constable had shown work in Birmingham in 1828 (Gillingham Mill; Birmingham Institution, no.31), 1830 (Helmingham Dell; Society of Arts, no.19) and 1832 (The Ferry; Society of Arts, no.171). See A Place for Art: The Story of the Royal Birmingham Society of Artists, exhibition catalogue, Royal Birmingham Society of Artists, Birmingham 2014, p.12; Birmingham Society of Arts Exhibition, 1834: Modern Works of Art, exhibition catalogue, Birmingham Society of Arts, Birmingham 1834, p.23. I am grateful to Veronica Pallett at the Birmingham Society of Artists’ archive for providing a copy of this latter catalogue. 81. Worcestershire Guardian, 27 August 1836, p.6. See Beckett 1967, p.64 for the suggestion that the exhibit listed as The Farm Yard was in fact The White Horse. 82. Crosby Ivy 1991, p.218. 83. Birmingham Society of Arts 1834, p.23. Amy Concannon, ‘The Painting’, in Amy Concannon (ed. ), In Focus: Salisbury Cathedral from the Meadows exhibited 1831 by John Constable, Tate Research Publication, 2017, https://www.tate.org.uk/research/publications/in-focus/salisbury-cathedral-constable/the-painting, accessed 23 April 2019.